A friend of mine who came to the UK from the former Yugoslavia used to tell me that the smell of a paprika stew cooking was one of the strongest reminders of his childhood. We did our best to recreate a paprikaš with chicken, but our attempts were at best mediocre and having watched the experts at work in Slavonski Brod I now suspect it might be hard to recreate fiš in the UK not least because the kind of freshwater fish that is common in Slavonia is seldom seen in the UK. I arrived in Slavonski Brod to great excitement. The mayor of Slavonski Brod was there, with two deputy mayors and a delegation of people from the local tourist office and the town. My hosts had taken over a pizza restaurant just by the old fortress and were busy preparing a bubbling cauldron of fiš. As we watched the deep, fragrant red stew cooking, they explained a little of how it is made. For each kilo of freshwater fish, you need a litre and a half of water. Two or three medium onions, oil, white wine (preferably local grasavina, if not a chardonnay can be used), a mixture of sweet and spicy paprika (to taste – our cook told us that he made a mild version which could be spiced up with extra hot paprika for those who wanted a hotter dish)and a herb mix which I’ve never come across in the UK but which I suspect included rosemary and oregano. 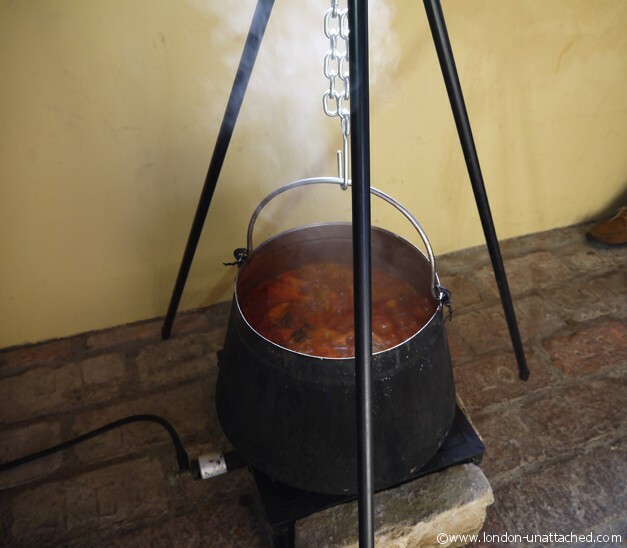 You also need some way of cooking over an indirect heat – not many UK households have a cauldron! First stew the onions in oil till they are soft, then add the paprika and stir through for a minute. Then add in a litre of the water. 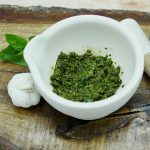 Cook this mixture for 15 minutes. Meanwhile mix together the remaining water with 300-500 ml of wine and two tablespoons of tomato paste. To finish the dish, add the cool wine/water/tomato liquid to the paprika sauce and then add in the fish chopped into large steaks. This, I was told, was important, to cool the cooking liquid down before adding the raw fish. Bring the mixture back up to a gentle simmer and cook for around 30 minutes till the fish pieces rise up to the top. Serve with fresh bread and flat egg noodles. To understand a little of why this dish is such a trademark of the region, it is important to realise that the borders of Slavonia are marked by great European river systems of the Danube, Drava and Sava rivers. So, unlike the fish stews I’ve eaten in Italy and France, fiš is a freshwater fish stew, made with Carp, Catfish, Pike, Trout and whatever other freshwater fish is to hand. It is filling and warming without being heavy and at least the version we ate was quite subtle in flavouring. My hosts told me that Slavonski Brod hosts a competition at the start of July on the banks of the river Sava, where over 100 competitors create their own version of fiš at the Fišijada. It must be quite a spectacle, with more than a hundred cauldrons bubbling away full of fiš. We ate; large bowls of fiš, ours made with carp and catfish, augmented with noodles, soft white bread and more grasavina. It was an occasion perhaps best described as ‘serious fun’ with everyone concentrating on the fiš and debating the finer points of carp versus catfish (apparently the latter is less bony and easier to eat) and which of the rivers running through Slavonia produced the best fish for fiš (consensus was that the Danube should receive that accolade). Now, having eaten my fill of fiš paprikaš we went to take a look at the fortress. Built in the first half of the eighteenth century, it dates to when Croatia was under Austro Hungarian rule. It was occupied by the Yugoslavian army during the home war and like the town itself suffered some damage. 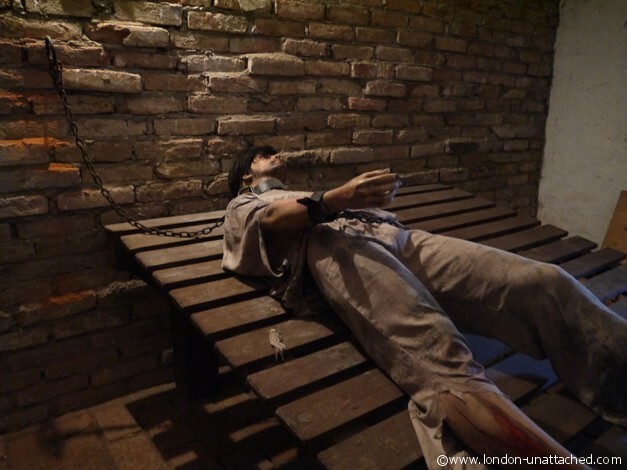 Now, buildings are being transformed into museums to celebrate the history and culture of Croatia. 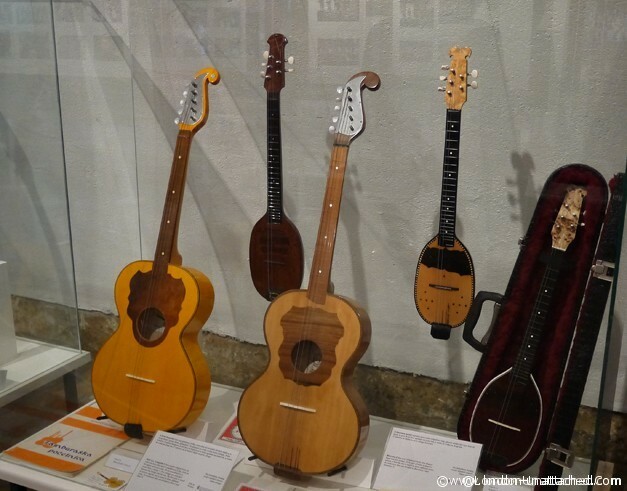 What I heard as the ‘tambourine’ museum turned out to be a collection of Tambura and Tamburica music, the stringed instrument that looks a little like a guitar or a lute. 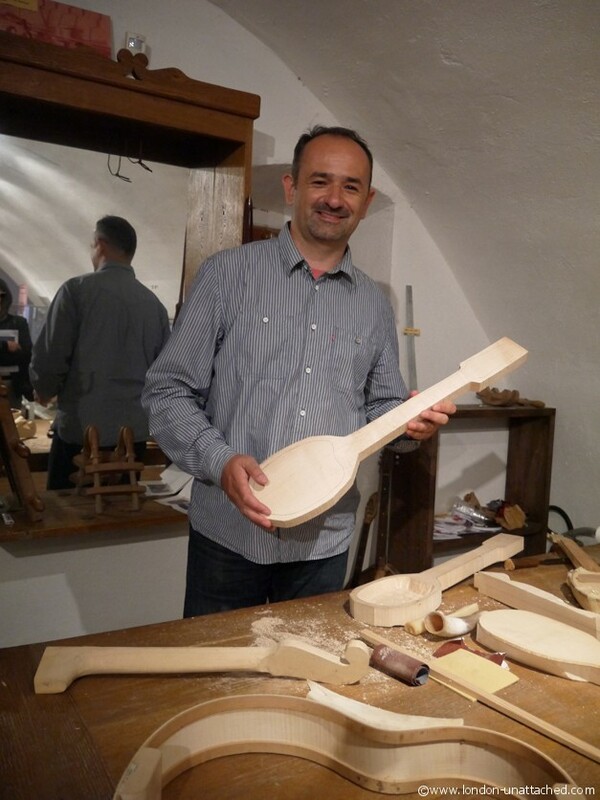 Small groups (usually of five players) or ‘orchestras’ play the music of Croatia throughout the country, but Slavonski Brod is regarded by many as being the home of the Tambura. 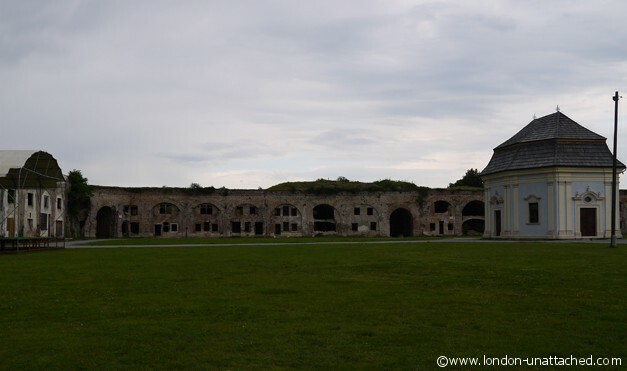 The rest of the fortress now houses reconstructions both permanent and at times living enactments of how it might have been used in the past, when it could accommodate up to 4,000 troops as part of a defense system against the Turkish Empire. Sadly there wasn’t time to look around the town itself which reportedly has a beautiful square. Of course that’s a great excuse to return. I went on to discover that the Austro-Hungarian influence on this part of Croatia has resulted in some beautiful buildings that might have been airlifted from Vienna. But this was my first stop. One which served as a perfect introduction to the warmth, enthusiasm, energy and humour of this part of the world. lol well it COULD have been a spoon for stirring the Fis. It just WASNT! I would love to see the instruments. This looks like a fascinating destination. The ‘tambourine’ museum looks great. I would love to visit. Wow, jealous! 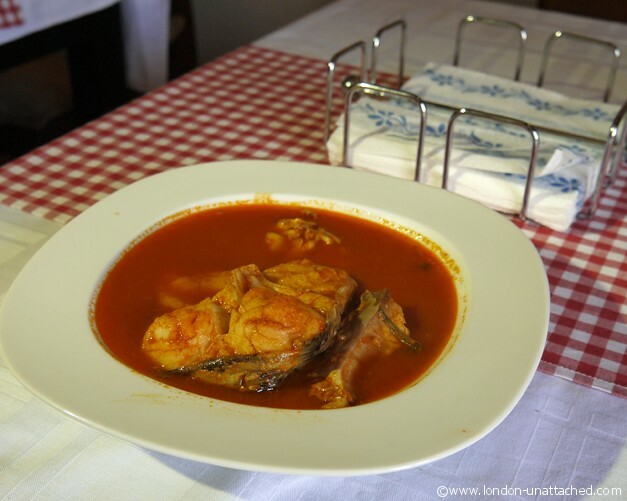 That stew looks amazing – like a Croatian version of a Boullaibaise?